While no one would dispute the importance of toys for children, the companies manufacturing them would be scrutinized for their financial prudence, market share, ROIs, etc. Having worked in toy Industry for about 2 decades and convinced with its imminent business potential, Adnan Chara (Adnan), CEO and MD, established Imagician Playthings LLP (Imagician) in 2016 and clocked in a revenue of INR10 crore within a year. While the organized players command 30% of the Indian toy market, it is the small and local players that have 70% of the Indian toy market.1 Buoyed by the initial success and the growth potential Adnan set out for himself the target of clocking in revenues of INR100 crore by 2022. However, with both domestic and global players charting aggressive market penetration strategies and being present for more than a decade, and with the ever-changing kids’ toy requirements, would Adnan be able to succeed in making Imagician a challenger brand in Indian toy industry? India had a glorious tradition of toys since the days of Harappa and Mohenjadaro civilizations (5000 years ago). Toys were designed on the basis of how a child would react to them. They were not just meant for a child’s entertainment but also to develop their minds, social development, impart learning, and its application to real life. Indian traditional toys and games were simple, easy to use, colourful and took inspiration from nature, the surrounding environment and people’s lifestyles, prevalent tradition and culture of the region (toys of gods & goddesses, puppets, dolls, miniatures of various items like carts, utensils, pots, cups, fruits, animals, birds, vehicles, etc.). There was huge diversity in the style of traditional toy making across India because of its varied cultural and traditional practices. Toy making was majorly a cottage industry, where toys were produced by local artisans and craftsmen communities spread across India. These communities worked with many materials, including terracotta, wood, clay, reeds, glass, pith, bamboo and paper-mâché. The organized toy sector in India was dominated by only a few home-grown and MNC brands, with Funskool (established in 1987) being the market leader with revenue of INR220 crore in 2017 (Exhibit IV). Apart from its own brands, Funskool also manufactures and distributes products in the Indian market under license from foreign toy brands including Hasbro, Lego, Disney, Warner Bros., Takara Tomy, and Ravensburger. I. Discuss the nature and business dynamics of Indian toy industry using Michael E. Porter’s Five Forces Model. II. What is a business model? What is Imagician’s Business Model? Would this business model help Adnan achieve his target of INR100 crore by 2022? After completing the first year of operations in the Indian toy industry and clocking a turnover of INR10 crore, during 2016-2017, Imagician Playthings LLP’s (Imagician) CEO and MD, Adnan Chara (Adnan), had nurtured an ambitious goal of reaching INR100 crore revenue by 2022. While the Indian toy market promised tremendous potential of around INR8,000 crore, the glaring fact was that 70% of the market was captured by unorganized players and only 30% was pocketed by organized/branded players. Even in this miniature share, a significant portion (of around 50%) was owned by foreign players like Mattel and Hasbro. In such scenario, would Adnan be able to fulfil his goals? What should be his competitive strategies for the same? 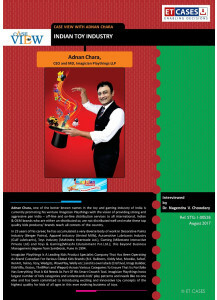 This case helps the participants in analysing the challenges that Adnan could probably face in the Indian toy industry. Students should be encouraged to read the following two seminal articles as the frameworks given in these two articles would be used during the classroom discussion of this case study. Exhibit (TN)-VI: Why Chinese Toy Imports? This case study can be used to discuss a new entrant's challenges in fighting for a competitive position in an established industry with entrenched global players and unorganized sector commanding a lion's share of the market. In the backdrop of Indian Toy Industry's competitive landscape, this case study chronicles the beginnings of a fledgling Indian start-up, Imagician Playthings LLP's (Imagician) foray into the toy industry. With a size of INR8,000 crore, Indian toy industry is dominated by unorganized/local players with about 70% market share. The organized sector - with the top branded players like Mattel, Lego, Funskool, Reliance's Learners Play, Shinsei Industries' Mintoy Pvt. Ltd., etc. - commands around 30% market share. With close to 400 million kids (0-14 years) and with an abysmal average spend of about INR250 (compared to UK kids' average spend of INR14,000), Imagician’s Adnan Chara (Adnan) seemed to have found a sweet spot. With INR10 crore of revenue over the first year of operation, Adnan is confident of achieving INR100 crore turnover by 2022. Can he? With several challenges ' especially from that of video/mobile games, brand building and last-mile facilitation - what would it take Adnan to position Imagician as a successful challenger brand in Indian toy industry? What should be the road map for Imagician to cross the INR100 crore milestone? With Imagician's business model - a mix of importing, selling licensed labels of foreign brands and making own brands - can Adnan's venture be a game changer for Indian toy industry?